We’re getting well into Summer here in Australia, and the question of how to keep our insulin safe in the heat keeps coming up. All the manufacturers will tell us are the storage requirements listed in the official drug approvals. Legally they would find it hard to recommend anything outside that without first going through new trials and getting regulatory approval. It used to be that Lantus was only rated to 25˚C, but the labelling was changed around early 2017 when it was re-certified to 30˚C. The rest of this article is about using insulin in a pump, so I’ll be concentrating on Humalog and NovoRapid, with a mention of Apidra at times. How long should I leave it in my pump? The information we get is mixed. In the Australian CMI (Consumer Medical Information) for each of NovoRapid and Humalog it states that the insulin in your pump’s reservoir should be discarded after 2 days. There are no instructions for how long to keep Apidra in a pump reservoir, as it’s not approved for use in a pump here. Use in an External Insulin Pump — Change the HUMALOG in the reservoir at least every 7 days, change the infusion sets and the infusion set insertion site at least every 3 days or after exposure to temperatures that exceed 98.6°F (37°C). Officially we’re told to only keep the insulin in our pump for 2 days under normal conditions. However most people change their teflon cannula only after 3 days, and very few people will stick to 2 days. Currently I’m putting about 6 days worth of Humalog into my pump reservoir, and changing cannula once during that time (or twice if I’m using steel cannulae for 2 days each). Note that in summer it’s not unusual in many locations for the ambient temperature to reach the high 30s (˚C). What are we supposed to do on those days that it sits above 40˚C? Also note that insulin doesn’t stop working as soon as it reaches 37˚C (otherwise it wouldn’t work inside our bodies!). How warm does it get in my pump? I did a similar exercise a year ago with a Medtronic pump when I was measuring the effect of temperature on lithium batteries. But now I’m using an Accu-Chek Combo pump, and have access to some other temperature monitors. I fitted my pump with a MedAngel One monitor, which logs the temperature and is linked to my phone via Bluetooth. These are usually used to monitor the temperature of medications such as insulin: I use one in my fridge, and have them in both of my insulin stashes when travelling. In this case I simply stuffed it into the pump case beside the pump. The pump lives in my hip pocket most of the time, so sometimes the MedAngel will be on the side of the pump against my leg, and sometimes against the outer layer of my pocket. But it seems a reasonable analog for the temperature of the insulin in the reservoir just beside it. So how warm is the Humalog in my pump? See for yourself. Overall it varies, in a range from 25-35 ˚C. This has remained fairly consistent, independent of the ambient temperatures as we’ve moved from Spring into Summer and we’ve had some days over 30˚C already. As noted I’ve been using the insulin for 6 days at a time. I have not yet noticed any change in my insulin sensitivity towards the end of those 6 days. My closed-loop system dynamically detects changes in my insulin sensitivity, and I have not noticed yet a shift at the start of a new reservoir. But this is over the 30˚C limit we’ve been trained to think about! Certainly I would not want my insulin to be above 30˚C for long if I was going to keep it around for weeks, but for a few days at the end of the insulin’s life it seems to be fine. I do make sure my stored insulin doesn’t go above 30˚C for extended periods. At home my supply lives in fridges, and on long trips I use Frio cooler packs to usually keep the temperature below 25˚C. 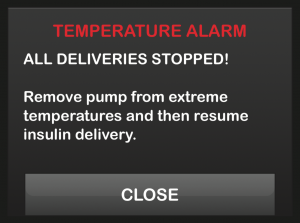 The Cellnovo pump stops delivery when the temperature reaches into the 40s, but it’s worth noting that the micropump mechanism there works by the thermal expansion of wax, and this won’t work when the system gets too hot – let alone what might be happening to the insulin. 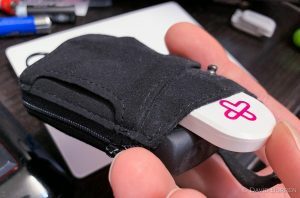 The Tandem t:slim X2 has a temperature monitor, and refuses to work if the temperature goes outside 2-45˚C. 45˚C does seem like a reasonable upper limit. 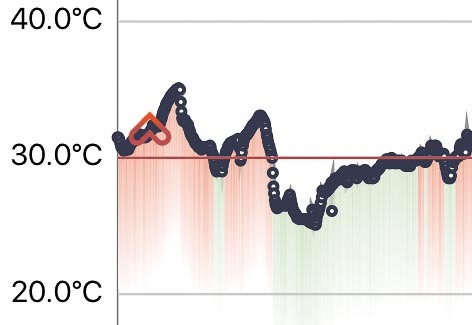 I’ve had a reservoir of insulin go “off” in the mid-40s (I had been slogging around an active geothermal area in PNG that day and it was very hot although I didn’t measure it). It took me a while to realise why my glucose levels were steadily climbing, but as soon as I replaced the reservoir it all came good again. I’m using Humalog, but based on the US documentation I’m expecting NovoRapid to behave similarly. When I was testing Apidra I was careful to replace the reservoir every 2 days as I didn’t want to explore any failure modes with longer use. On “normal” days I will continue to carry my Humalog in my pocket for days at a time. In the heat of summer I may revert to only putting 3 days worth of insulin into the reservoir each time, but for now 6 days is working fine. as said by: The ultimate insulin cooker.